When Wendy and I married, December suddenly became much more than just a Christmas holiday. Wendy’s birthday is December 21, and we married on New Year’s Eve. That means that I have, arguably, the three most important gift-giving days of the year in an 11 day stretch. After 12 years (a number rife with Biblical significance) trying to find balance in this celestial conjunction of celebrations, our first grandchild unexpectedly, like the star of Bethlehem, appeared on the horizon last year and plotted his arrival on December 11th. An already crazy month just got crazier. Milo and his parents (I state it this way because, let’s be honest, it’s all about the one-year-old) arrived home from the UK in early December. I picked up them up and drove them home from MSP. The kids made our house command central out of which “Operation Celebrations” would be conducted. Milo has four sets of grandparents, a full contingency of living great-grandparents, and at least one great-great-grandparent. Long story short: There’s a lot of people needing a Milo fix. Our celebration of Milo’s first birthday happened the night of the 12th. We had a small cadre of family over for a relatively small affair. Ya-Ya Wendy made Milo both a chocolate cupcake and a white, funfetti cupcake. He seemed to prefer the funfetti cupcake, proving that his taste bud genes are inherited from his paternal DNA coding. Walking is a lot easier with one of these things! The rounds of family visitation continued on the 19th when Taylor, Milo, and I stopped by my folks retirement community to have lunch with the folks. Milo was, of course, a huge hit. Milo also had a fascination with all of the various walkers with wheels. As he is in training to get the whole “walking” thing down (we’re up to about six consecutive steps without falling at this point), it was a huge discovery for him that there are devices designed and manufactured to assist in this basic human motor skill (special “thanks” to Mary for letting Milo run free with her walker). 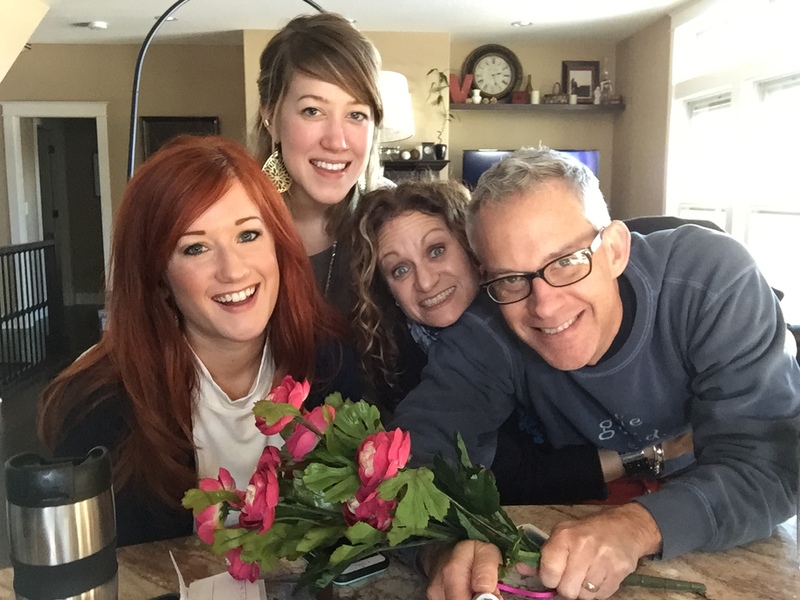 Wendy and I began celebration of her birthday on the 15th when we headed to the Twin Cities. On the 16th we went to our first Vikings game at their new “mother ship” stadium. An annual trip to see the Vikings had become a bit of a tradition for us until it was announced that the new stadium would be built. Wendy and cold get along like Hamilton and Burr, so we skipped the seasons they were playing at the U of M’s outdoor stadium. We finally decided to all the trigger on our old tradition. It was a lot of fun. We’ll be back. Wendy’s birthday was otherwise fairly quiet except for the doorbell ringing incessantly. She got a trifecta of flower bouquets on her big day. The florist here in Pella was grateful for the business, though they somehow couldn’t get the deliveries consolidated. On the following weekend our friends Kevin and Becky came to Pella to celebrate Wendy. A pint at the Cellar and a pizza from George’s was in order with the rest of the evening relaxing at Vander Well Pub. Maddy Kate flew in from her home in South Carolina on Christmas Eve day. We visited Grandpa Dean and Grandma Jeanne before I drove her back to Pella. She joined Wendy and me at Christmas Eve services at church while Milo and his entourage were making an all day tour stop at Na-Na Brenda’s. Christmas day, I’m happy to say, was an all-out, love-and-laughter, food-and fun, lazy lounge-fest with just the six of us. Wendy made her traditional Christmas morning cinnamon rolls, along with an awesome breakfast. I threw French Dip into the crock pot for the evening meal. Lunch was a charcuterie menagerie for all. We opened gifts together after breakfast, then moved a mattress into the family room next to the sectional for a blissful day of binge watching (This is Us took up the entire afternoon), eating, and napping together. Chocolate or Funfetti cupcake. Which will he choose? Nothing like a tunnel for your birthday! Maddy napping on Christmas day. Gotta love the Nutcracker apron! Wendy and Rudolph, er, Milo. Tom & Wendy at Vikings game. Not just one, but TWO cupcakes from which to choose! As years go, 2016 is off to a frantic start. It’s hard to believe that January is almost over! Business travel dominated the first two-week of the month with trips to Minnesota and Texas, respectively. Work, in general, has dominated a lot of my time and energy as our group scrambles to finish up some late 2015 business and get 2016 projects off the ground. Jan 2-3 we enjoyed a visit from our nephew (a Green Bay Packer fan), Sam and his gorgeous (Viking loving) bride, Lydia. It was awesome to have them spend the weekend with us, and a Viking victory to win the NFC North capped it off perfectly (at least from our perspective). We loved having our girls home! Jan 17-18 was a homecoming for Maddy Kate. Taylor brought her to Pella on Sunday morning to hear me preach. It was the first time the four of us have been together since Sam and Lydia’s wedding last summer, and we enjoyed a nice family dinner together before Tay headed back to Des Moines. Madison, Wendy and I had family movie night Sunday evening (watched Happy Thank You More Please) and on Monday I took her back to Des Moines. I then got a daddy-daughter date with Taylor. We went to see The Revenant together, which Wendy had no interest in watching. 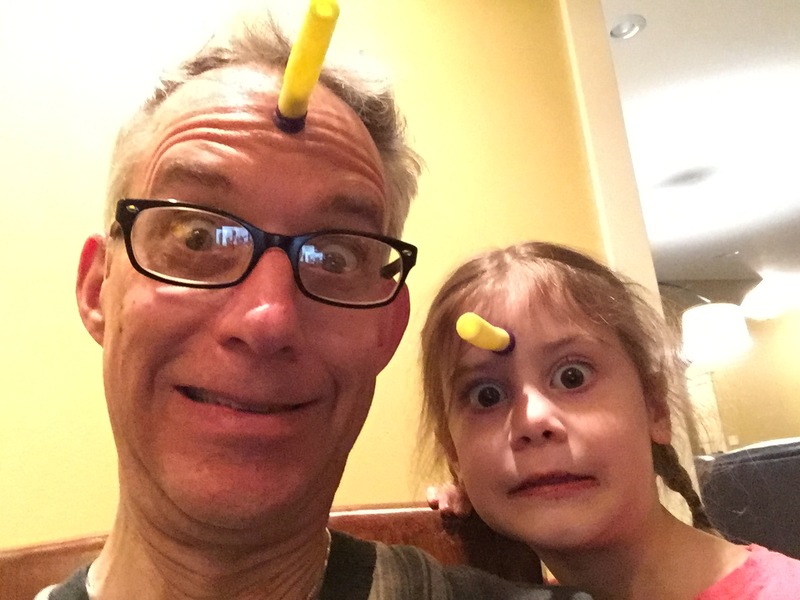 I had fun teaching Madeline the joy of sticking nerf darts on your forehead! We enjoyed having dinner with friends Mat, Anne, and Madeline just before they headed to Merida, Mexico to live for the next few months. 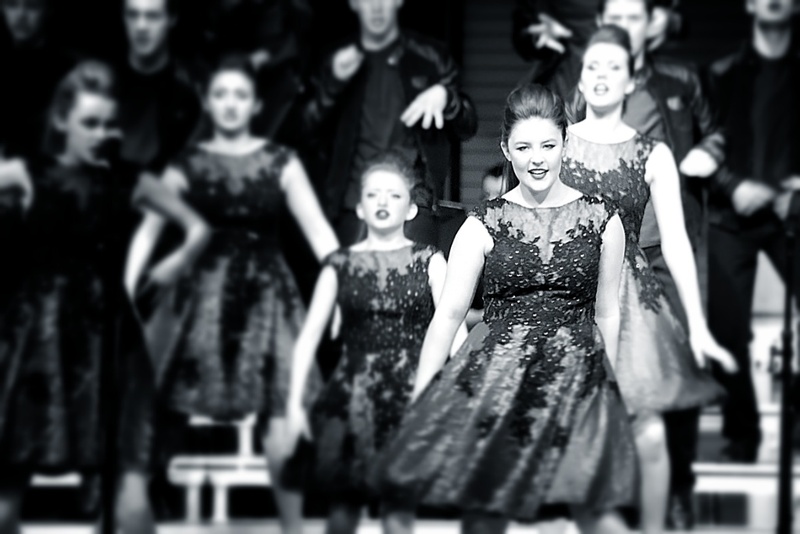 Our niece, Emma, performs with her high school show choir. We went to Dallas Center Grimes High School to watch our niece, Emma, and friends Harry and Kennedy along with a host of Pella kids in the Show Choir contest there. Dinner with Kev and Beck was a nice perk to the event. Rehearsals began in earnest for Union Street Players production of Almost, Maine. The play is a series of nine vignettes stitched together that all take place at the same moment on a winter’s night in northern Maine. It’s a wonderful play. I’m in five scenes playing five different characters. Wendy is in three of them. The show is being directed by our friend, Kevin McQuade. We’re really enjoying getting back on stage together. Performances are April 14-17. My friend Matthew Burch and I have been presenting a four-week series on Overcoming Shame in the auditorium services at Third Church this month. Matthew and I are doing a workshop for men called More Than Conquerors at Westview Church in Waukee next weekend on the same topic. Christmas is less than a week away, but it certainly doesn’t feel like it. The weather in Iowa has continued to be unseasonably warm for the most part. Instead of snow and ice we’ve had chilly downpours that feel more like March or October. Right after my last Sunday Summary post we hosted the cast party for Union Street Players (USP’s) The Lion, the Witch, and the Wardrobe. We loved having cast and crew here at the house. They did a great job. We weren’t involved in the show other than helping man the box office phone and sell tickets. In fact, it’s been a while since Wendy or I have been on stage. Two weeks ago we auditioned for Union Street Players’ upcoming production of Almost, Maine and were cast. The show is a romantic comedy set on a moonless winter night in a mythical town in northern Maine. In a series of vignettes, a series of couples struggle with that thing called love. Wendy and I will play multiple roles in the show which will be performed April 14-17. 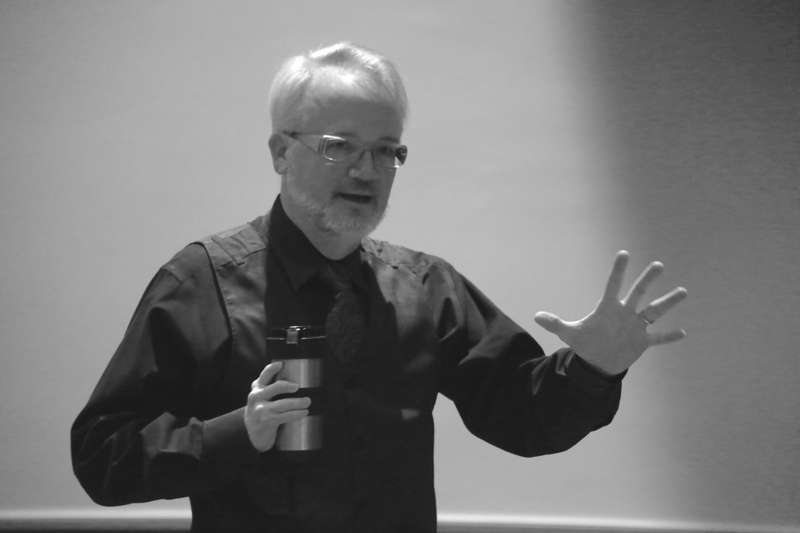 We’re looking forward to working with our friend and neighbor, Kevin McQuade, who is directing the show. While we haven’t been on stage, we have been in character. On the 11th we donned the period costumes of our town’s founders, Dominie H.P. Scholte and his wife Maria, and played host at the Scholte House Museum to a corporate Christmas dinner for the executives of a business here in town. Wendy and I have portrayed the Scholtes in numerous productions. We enjoy volunteering our time and helping share their unique story. Later that night we joined Taylor and her friend at Peace Tree Brewery in Knoxville for their annual Christmas sweater party. The band included Taylor’s faculty advisor from Grandview and we enjoyed the evening. I love that Madison has an Iowa flag on her car!! I was on the road this past week. Visited client in Texas on Monday and Tuesday. On Wednesday I flew to Denver where I visited another client, then drove down to Colorado Springs. Madison had her last college final that evening. I met her at her favorite coffee haunt and we enjoyed a Crave Burger with Brett and Evan Strait. Madison has been living with the Straits for the past couple of months as her lease was up and she’s not sure where the path will lead after graduation. Madison headed to her test and I visited with the Straits. I then met her at BJ’s Brewhouse across from campus after her test was done and we celebrated together joined by her friend, Matt. We got to enjoy breakfast together and hang out for a few hours the following morning before I had to head for home. On Friday I got to greet Suzanna who is home from Cedar Falls for Christmas break. She’s had a great first semester in college and it’s great to have her home. On Friday afternoon Wendy and I headed to Des Moines for the funeral of my friend and mentor, Chuck Wenger who was also founder of our company, C Wenger Group. It was a great memorial service. Chuck had committed his life to mentoring young men, and it was rather incredible to hear the testimonies from many who were in attendance. It was also great to see former group members, clients, and friends. On Friday night we joined friends Kevin, Linda, Rob, Vandy and CD at McQuade Pub for a reading of the script Art. It was a great excuse to spend an evening of food, drink and good company. The script was great and we both enjoyed it immensely. Wendy’s birthday is Monday, so we started celebrating on Saturday with an early matinée of Star Wars: The Force Awakens. We loved it! We ran a few errands before hightailing it back home. In the evening I took Wendy to dinner at Kaldera with Kevin and Linda (where we ran into the JPs & VLs!) . After dinner we retired back to V-Dub Pub for a night-cap. We have been talking for months with our friends Vandy and Rob about getting together to watch football. They are still relatively new to town and Vandy is a Vikings fan. So, today was the day! They arrived before noon and we watched the Vikes beat the Bears, while keeping an eye on Rob’s Giants who came back and then fell short against the undefeated Panthers. I’m looking forward to continuing Wendy’s birthday celebration tomorrow, and to Christmas celebrations with family this week! I’m headed to the Twin Cities of Minneapolis and St. Paul today. I’ve been going to the Twin Cities for many years and have had many clients there over the years. Wendy and I try to make a habit of spending at least one or two weekends a year enjoying all that the area has to offer. Cool summers. Yes, the winter can be brutal, but the other three seasons of the year are absolutely spectacular. I love that when it’s sweltering back home I can feel crisp, cool air in the Minnesota mornings. Vikings! As a life-long Vikings fan I love going to see my favorite Purple People Eaters play. And, even when I’m not going to a game I get Vikings chatter on the local sports stations. The Guthrie Theater. The best regional theater in the midwest with three amazing stages, world-class productions, and a facility that truly lets you experience what an evening of theatre should be. The Minneapolis Children’s Theatre. Trust me, it’s not just for children. I have never attended a play at MCT that didn’t leave me inspired, entertained, impressed, and wanting more. Al’s Breakfast. (pictured) The hole-in-the-wall diner in Dinky town has been a family favorite for many years. It can’t adequately be described. It just has to be experienced. It was a very enjoyable weekend for Wendy, Suzanna and me. As I mentioned in my previous post, we hosted a script reading on Friday night. It was a wonderful and fascinating mixture of people. There were several from our circle of theatre friends, but we also had some friends who had never been to a script reading before and for whom it was a new experience. There was a lot of laughter, and fun had by all. The final guest left some time after midnight and Wendy and I didn’t get to bed until after 1:00 a.m.
Saturday was Wendy’s birthday! Her wish was to spend a quiet day together and then go out with friends in the evening. We got the first half accomplished as we spent a leisurely day together. She opened her gifts in the morning and we watched some shows from our growing DVR queue. Our evening plans were scuttled when our friends from Des Moines chose not to drive down after hearing snow in the forecast. I feel bad for Wendy and all who have birthdays this time of year. It’s such a bummer when your own birthday party gets cancelled, especially when it’s cancelled on the threat of snow and it turns our it all would have been just fine. Nevertheless, Suzanna and I took Wendy out to eat and we came back home to watch Brave. We were blessed with an unscheduled visit by Chad and Shay later in the evening which lifted Wendy’s spirits. The snow did arrive during the night. We had 6-8 inches of it. So, we decided to continue the theme of a quiet weekend at home. I got the snowblower out for the first time this year and we watched our Vikings get crushed by the Bengals. Yikes, I can’t wait for this season to be over so we can put it behind us. We then finished up the last of the wrapping of Christmas gifts and got the house picked up so that we’re ready for Christmas.